I have been thinking lately how to bring my blog to the next level and get involved in Social Media. For me this is a huge thing because I HATE Facebook. I know that is a sin and I should not do it. It's all about every one in the world knowing what I am doing. That sounds funny from a Guy that has a quilting blog (and tons of other blogs and sites I try to promote). How can I hate social media if I love to be social. So today I make my first step in the social world by accepting the fact that its not bad to be such. And as proof of that I have created a Google+ page for Richard and Tanya Quilts. What can I say I like Google more then Facebook. But being fair to those that don't like Google, but love Facebook I created a Facebook page for Richard and Tanya Quilts. But we can't stop there I also love Pinterest and just love to be pinned and pin there under my name https://pinterest.com/rhealey101/. What do I ask of you my faithful followers? While if you like my post please G+ it (you can find the G+ at end of each post. You can also add my Google+ page to your circles. For those that love or like (or want to convert me back to the Facebook as there stock tumbles) please Like the Richard and Tanya Quilts Facebook page. You can also Facebook about any of my posts (there is also a button for this, twitter, blogging and emailing about post) right next to the G+ button. Also please Pin any and all you find or like on Pinterest. I also sell my wonderful quilts (and willing to make custom quilts for any that might like) though http://www.etsy.com/shop/RichardQuilts and for those that are interested use the Coupon Code BLOGDISCOUNT to get 20% off. Well enough thinking lets talk about what Tanya and I did this last week. I have been busy I finished my newest batik quilt top. I have yet to come up with a name (or what to put on its back) this is the largest pieced quilt to date. It is a decent size twin top (Rebecca who's bed I tested it on offered to keep it but I don't think so) I am pretty sure I plan to sell this one. I am getting more confident and quilts are getting bigger. I would love to make one similar to this one queen size for my bed. My baby Dresden had its binding finished last night. I was looking around to figure out where my labels where when I got distracted. I still need to finish putting the label on it and washing it to call if finished so expect to see it again soon. Tanya this week finished her first quilt (While made me finish her first quilt for her) I tried to get her to quilt it but she would not. She was afraid to mess it up. She pieced the entire quilt top her self and pieced the back and basted the quilt. I quilted and put the binding on. I will soon get her to do this too. You thought my social media thing was all done but NOPE!! you are wrong. Many of my followers might have noticed that I added many of you on Google+ today and as time goes on I will add the rest of you. (I simply ran out of time). While I was in the midst of writing this post it came to my realization that I had never tweeted or been tweeted too (Is that even the correct term?) So I went out and did the ultimate sacrifice and created a twitter account. So you can follow me or tweet me at @rhealey101. I have no clue how to tweet so some one tweet me some instructions. By the way check back next week I will be having a giveaway to any one that can help me get social up to date. Now tell me your opinion to all this social crap! Today is a Work In Progress Wednesday. 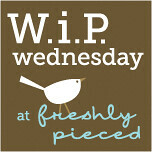 I will be linking up with Freshly Pieced. Well done to Tanya for completing her first quilt! It looks great! Loving the baby Dresden - great fabric choices. Oh social media - it's something we love to hate or hate to love isn't it! Good luck with your new ventures! Well done, Tanya! I love purple and I love this quilt! Richard, I really like the quilt you made in your batiks. Very pretty! Also, I know we are hooked up with google+, but I know nothing about it! I really like the fabric choices for the Baby Dresden! It's such a pretty block and yours is awesome! Oooo... love the Dresden. I'm about to do a Dresden block for the first time in a BOM I'm doing. RE: social media... if you are trying to run a business or market yourself, it's a must! FB, twitter, blog, G+, and Pinterest. It gets your name and business out there. The more people see it, the more likely they will remember next time they are looking to buy something. Marketing 101 (and I have an MBA). Thanks for sharing all the wips and stuff. Love it! Love the batik! Looks like a blackberry cobbler to me. Tanya is coming right along. it is such a joy to read of your adventures together. Your baby Dresden is so pretty! Thanks for linking up with WIP Wednesday. I don't Facebook, didn't know Google had something, Twitter/tweet, or anything else. The fact that I have a blog, and started it all on my own was a huge surprise to my hubby and sons. Computers and I are NOT friends. I do good to work my phone (I can text). Good luck on all of those things. I barely have time to keep up in the bloggy world and still find a few minutes here and there to sew. I like what you're doing with the batik top. That sashing reminds me of a similar idea I'm using on a WIP - I am framing the alternate blocks with a neutral to cut the busyness. Good work all around! I am super impressed! I don't have the patience to quilt myself, but I give mad props to those that do! I love and hate Facebook. I hate the negativity, and the reports I land up getting in my feed of people's gaming. I love the faint contact I get with my friends who live across the world. Strangely enough I find my English friends are not as prolific on Fb as my US and SA friends. Odd that.